In my previous post, I described some of the Asynchronous Batch Process Solution (ABP) version 2 internals. In the next posts, I would like to go through different business scenarios and explain how to use the ABP solution, step by step. As always, I advise against publishing any external solution on your production environment without testing it first. 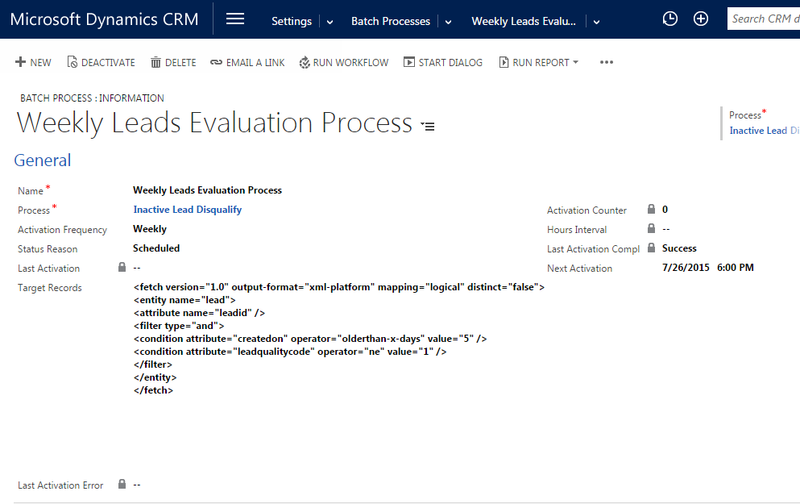 This scenario describes a business logic operation (Action) which is automatically applied to a collection of Microsoft Dynamics CRM records (target records), either once or repeatedly. 16. Click Save to schedule the Batch Process. You are done! The Batch Process is set and waiting for the next activation date and time. 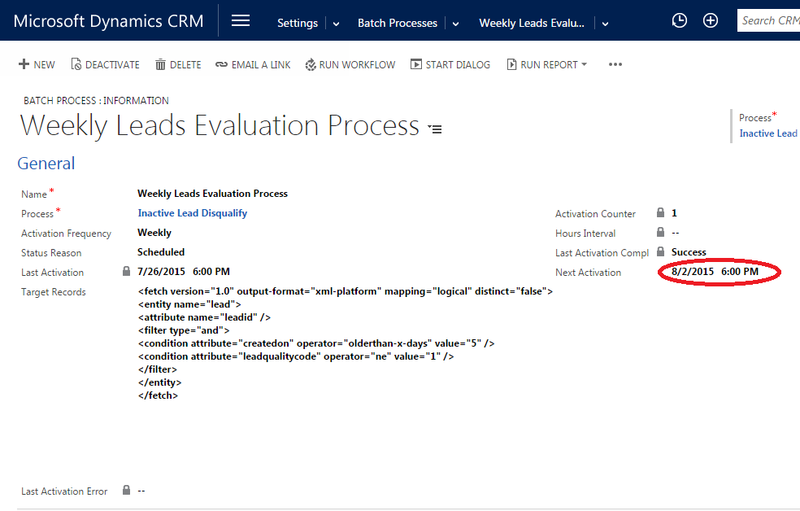 Looking at the Background Processes tab for the Batch Process record, you should notice one waiting Workflow instance which is waiting to retrieve all matching Lead records and to apply the Inactive Lead Disqualify process to each resulting record. Once the Batch Process was executed once, you will notice that the Next Activation date was rescheduled for one week after the last activation. If all went right, the Last Activation Completion Status is Success and the Activation Counter is set to 1. If you created a background Workflow Rule, you can view a list of the records that were affected by the batch process execution. 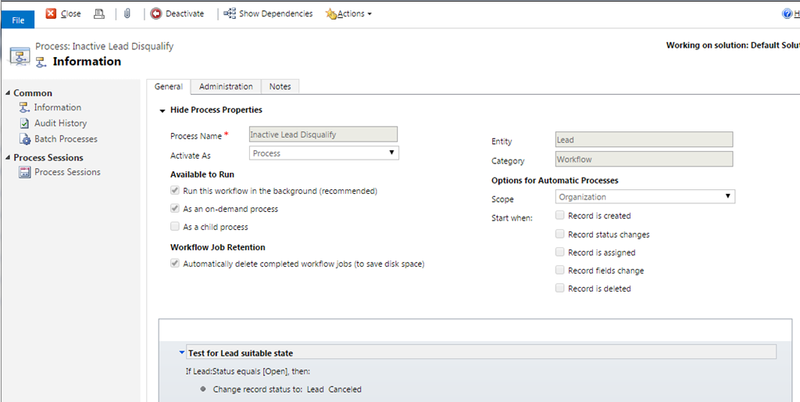 To do that, navigate to the Inactive Lead Disqualify workflow rule and click the Process Sessions tab. If you would like to deactivate the Batch Process scheduling, change the Status Reason value to ‘Suspended’ and save. Since there may already be a Workflow instance scheduled and waiting, go to the Background Processes for the Batch Process record and cancel waiting instances. This also applies if you change the Next Activation date/time once the Batch Process record is already created and scheduled. In the next post, I’ll walkthrough the Aggregative Query Scenario.